Costa Rica is one of the world’s best destinations for nature-filled adventure vacations, the small yet action-packed nation seamlessly blending unspoiled wilderness with adrenaline-pumping activities. in many ways, Costa Rica is the birthplace of such vacations, being the poster-child for eco-tourism on our planet. 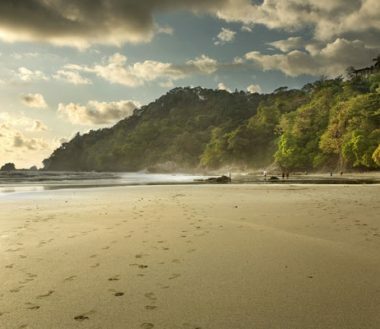 Whilst you could head here to sit on a gorgeous beach and soak up some rays, the treasures of Costa Rica are best experienced at great speeds – whether on a kayak, white water raft, a horse saddle, mountain bike or – most fun of all – on a suspended zip-line set across the canopy of exceptionally luscious rain forests. Tailor-made for those who love to explore further on their travels, include active tours in their itineraries or simply those who just can’t sit still, this country is all about superlative fun in exceptional nature. Because, sometimes, just looking at a rain forest, volcano, waterfall and beach isn’t enough! 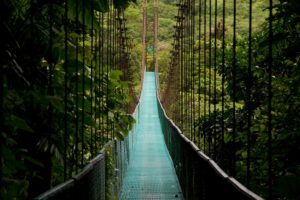 Even though there are literally 101 exceptionally fun things to do in Costa Rica, there are a few activities for which the country is world-renowned. One of them is volcano climbing. The most popular crater rim to reach is undoubtedly Rincon de la Vieja, mostly because it’s a challenging hike (a full-day excursion), showcases amazing fauna variety and landscapes and (perhaps more importantly) is intermittently semi-active. The fumaroles from the top are impossible for adrenaline-junkies to ignore! 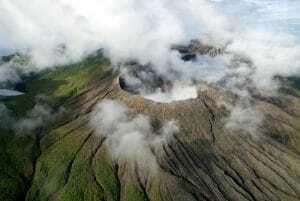 The trail is often closed due to safety reason and if it happens during your vacation, do not panic: Costa Rica boasts nearly 70 volcanic peaks, only half a dozen of which are active. When locals tell you ‘there’s a volcano nearby you can climb’, trust them that they mean it – there’s an option here in every province. Uber-famous Arenal is the most active in the country (and arguably the world) and the resulting fertility of the soil is what makes hiking here so rewarding. Even if you can’t (or don’t wish to) reach the peak, it almost doesn’t matter – go volcano climbing in Costa Rica and you’ll be spending your hours meandering through some of the lushest, wildlife-enriched national parks on the planet. And you’ll always enjoy stunning views of the peak. A magical playground for young and old alike, Monteverde is one of the most distinctive pockets of wilderness in Costa Rica. You can explore it at length on foot, by following the trail traversing the park, which includes half a dozen dreamy floating bridges, the longest of which spans just a few steps shy of 1000 feet. Getting lost in the cloud-drenched forests here is a truly magical experience, with aerial trams aiding families with very young kids. There are also ‘reserves within the reserve’ to visit, a particularly rewarding one being CuriChanca because it has a great density of wildlife but usually sees far fewer tourists. Most visitors just head up to this high-set forest for a single day but if you can squeeze in a longer visit, you’ll absolutely love exploring off the beaten trail. Monteverde has had a very interesting history and boasts a few clusters of lovely lodges and great restaurants, as well as an ethereal Butterfly Forrest, a Bat Jungle, Frog Pond and – most impressive of all – night walks to spot nocturnal wildlife. If you’d love to be totally immersed in wilderness for a few days then Monteverde is absolutely ideal – it has everything you need without the mega malls and mega resorts you might not. Simply Costa Rica nature at its absolute finest. Let’s get one thing straight: any adventure vacation in Costa Rica is bound to include some form of wildlife-watching event, simply because this is one of the most biodiverse nations on earth. So what would happen if you visited THE most bio-diverse corner of THE most bio-diverse country? You get a wildlife bonanza! 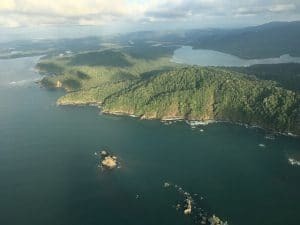 Corcovado, the crown jewel of the Osa Peninsula, is remote, wild, spellbinding and, thanks to a convenient regional airport, also easy to visit in just a one-week vacay. The most commonly spotted animals in Corcovado are gloriously colorful macaws, capuchin monkeys, anteaters and tapirs although the park’s most revered residents – large cats like pumas and jaguars – are what everyone comes to see. Harder to spot though they may be, there’ll certainly be plenty of wild creatures here to get you totally hooked. Established almost 45 years ago as a protected reserve, Corcovado is home to nearly 150 species of mammals, over 400 species of birds and thousands of plants, most of which are endemic to the region. The Osa itself is a wilderness lover’s paradise and Corcovado, on its own accord, is absolutely unmissable. Read more about Corcovado National Park and the Osa Peninsula. Cocos Island is one of Costa Rica’s most precious UNESCO-listed treasures and considered one of the world’s best diving destinations. Floating a few hundred miles offshore in the Puntarenas Province, Cocos attracts avid divers from all over the world, many of whom merely use San Jose as a springboard to their diving trip. Fervently protected by the government and home to an insane concentration of marine life around its shores, Cocos is astonishingly beautiful. Its nutrient-rich waters attract schooling hammerhead sharks, migrating whales, orcas, an abundance of exotic fish and sensational pinnacles. There are 20 sites to explore underwater and the only way to soak up the splendors is on a live-aboard journey. Given this reason, the remoteness, and challenging currents, Cocos is considered ideal for experienced divers and snorkelers. Plan your visit during the driest season (between December and May) to ensure great visibility and calmer seas. Determining how many shades of blue waterfalls can come in is unarguably one of the best things to do in Costa Rica. 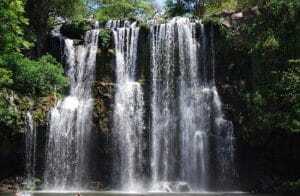 A country boasting so many rivers and mountains is bound to hide a cache of superb waterfalls so it may not surprise you to know that, in total, the country boasts hundreds of amazing cascades. Some are world-famous and highly-coveted, mostly because they are not only jaw-dropping but also super convenient to reach, many just a short distance away from a major road. Have more time up your sleeve and an adventurous spirit? Then do check out the glistening falls at La Fortuna, La Paz and Rio Celeste (You will NOT believe the iridescent shade of blue!) and then dive right off the trail, pinning Bajor del Toro, the multi-tiered Nauyaca and the otherworldly Llanos de Cortez. Find out more details about each of these in our Most Picturesque Waterfalls in Costa Rica guide and enjoy a truly unrivaled waterfall-hopping adventure. 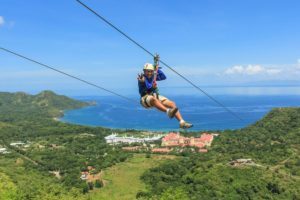 Along with volcano climbing zip-lining is king in Costa Rica: one of the activities which propelled the country into the eco-tourism superstardom. 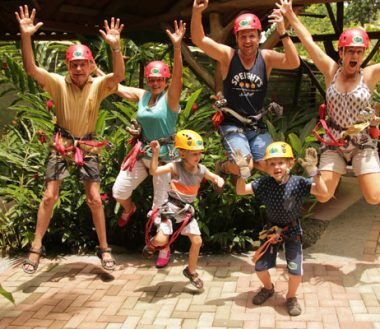 Zip-lining is a fantastic experience, which can be as adrenaline-pumping (or not) as you’d like. The great thing about zipping along the canopy of pristine forests is that this allows you the chance to explore its heart, see its wildlife and soak up its essence, whilst leaving a minimal impact on the environment. 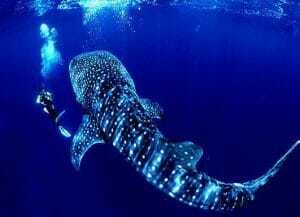 This is eco-friendly a wilderness adventure as you could ever have, anywhere in the world. The most popular zip-line adventures are set up in the most tourist-ed regions, so you’ll find options in Arenal, Monteverde and Manuel Antonio. Yet there are plenty of zip-line adventures to be had in more remote areas, like the crazy runs in Jaco in the Nicoya Peninsula (an absolute thrill-seeker’s delight!) and Playa Matapalo (Diamante) the latter being the longest dual course in Central America. Yes, you and your traveling buddy can fly, side by side, enjoying the heart-stopping thrills for over 4,400 feet. If you manage to keep your eyes open (a challenge, let us assure you) you can soak up the most magnificent ocean views of all. 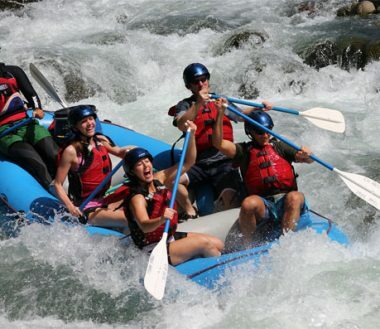 Among the international white-water rafting scene, Costa Rica is renowned for boasting some of the world’s best runs, the National Geographic naming our Pacuare River one of the best adrenaline-rushing destinations on earth. We couldn’t agree more! This river trumps all others, as far as we’re concerned, because the best rapids are accessed from one of the remotest and least-crowded regions in Costa Rica, so by chasing sensational drops here, you’re effectively keeping well away from the usual touristy crowds of the west. Wand where there’s white water, you know they’ll be kayaking, mountain biking, hiking, horseback riding and wildlife-watching – the Pacuare traverses some of the most pristine wilderness in the country and on a white-water rafting vacation here, you’ll have the very best of the country right at the tip of your paddle. 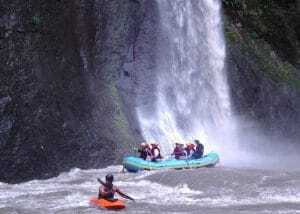 Discover more about the Pacuare River and why it’s considered Costa Rica’s best adrenaline rush. Prefer to kayak? You’ll have a field day here! Read more about the Most Scenic Rivers in Costa Rica, where you’ll discover options for experienced paddlers and novices alike. Ready to dive right in and enjoy the best wilderness experiences in Costa Rica? Then head on over to our Costa Rica Adventure Vacations page and see just how much action, fun, wilderness and wildlife we can squeeze into your unforgettable visit.